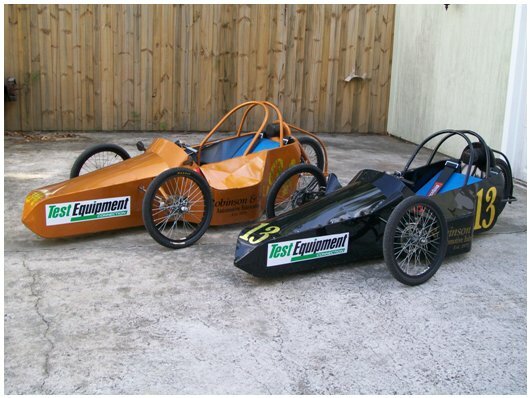 Test Equipment Connection Co. is proud to announce our Sponsorship of the ‘Silver Bullet Racing’ Electrathon Racing Team! An Electrathon is a light weight 3-4 wheeled battery powered vehicle, not unlike a hybrid between a box-car racer and a go-cart. Throughout the three decades since its invention, Electrathon racing has spread throughout the western world, gaining popularity with high-school and post-secondary youth due to its low entry cost, and the practical application of moderate-advanced engineering concepts. Electrathon Teams participate in races that are not measured by time, but distance; traditionally the distance that can be covered in one hour. Thus each Electrathon Vehicle is built for efficiency, stressing balancing aerodynamics and effective use of battery power over top-speed. The pursuit of this intriguing mechanical problem is the perfect platform for Test Equipment to promote given the complex engineering challenges at play. We’d like to wish Jim Robinson and the rest of the Silver Bullet Racing team the best of luck as they compete in the Tampa Bay Electrathon Racing League!